Noble Gamification benefits are multi-fold and are seen across all levels of the organization. We are honored by TMC’s recognition of Noble’s commitment to delivering technologies that help companies improve their CX and employee engagement. 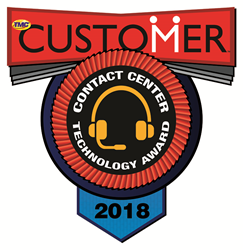 Noble Systems Corporation, a global leader in omnichannel contact center technologies, is excited to announce that its Noble® Gamification solution has received TMC’s “2018 CUSTOMER Contact Center Technology Award”. The award is presented by CUSTOMER magazine. Noble Systems Corporation is a global leader in the customer communications industry, providing innovative solutions for Contact Center, Workforce Engagement, and Analytics. Tens of thousands of agents at client installations worldwide use Noble platforms to manage millions of customer contacts each day. Noble offers a unified suite of inbound, outbound and blended omnichannel communications, strategy planning, resource management, and compliance tools for companies of all sizes. Our premise, cloud, and innovative premise/cloud hybrid platforms include ACD, predictive dialing, blended processing, recording and monitoring, IVR, messaging, interaction analytics, workforce management, and gamification. With a portfolio of 165 patents and growing, Noble leads the way in pioneering solutions for the contact center market. For more information, contact Lee Allum at 1.888.8NOBLE8 or visit http://www.noblesystems.com. Through education, industry news, live events and social influence, global buyers rely on TMC’s content-driven marketplaces to make purchase decisions and navigate markets. As a result, leading technology vendors turn to TMC for unparalleled branding, thought leadership and lead generation opportunities. Our in-person and online events deliver unmatched visibility and sales prospects for all percipients. Through our custom lead generation programs, we provide clients with an ongoing stream of leads that turn into sales opportunities and build databases. Additionally, we bolster brand reputations with the millions of impressions from display advertising on our news sites and newsletters. Making TMC a 360 degree marketing solution, we offer comprehensive event and road show management services and custom content creation with expertly ghost-crafted blogs, press releases, articles and marketing collateral to help with SEO, branding, and overall marketing efforts. For more information about TMC, visit http://www.tmcnet.com.